After you have decided on the database or search tool you will use, you're ready to begin your search for funders using the keyword list you developed earlier in the process. Keywords should tie in with the type of work you do, where you work, the population you work with, etc. To avoid reviewing the same foundation multiple times, you'll want to create a system to document which foundations and opportunities you have reviewed, which ones deserve follow-up, and which ones are not a good fit and should be dropped from your list. Subscription donor databases give you the option of saving your search results. If you are relying on Google or another free search tool, you'll need to create a system to track your search results. One option for saving the search results is to create an Excel spreadsheet. Once created, you can store it in a shared electronic folder to allow for easy access by colleagues performing prospect research along with you. A second option is to use an online information management tools such as Trello (see the post How to Use Trello for Grant Research & Writing). You can also choose to go the paper route and print out a hard copy of your spreadsheet and complete it by hand. 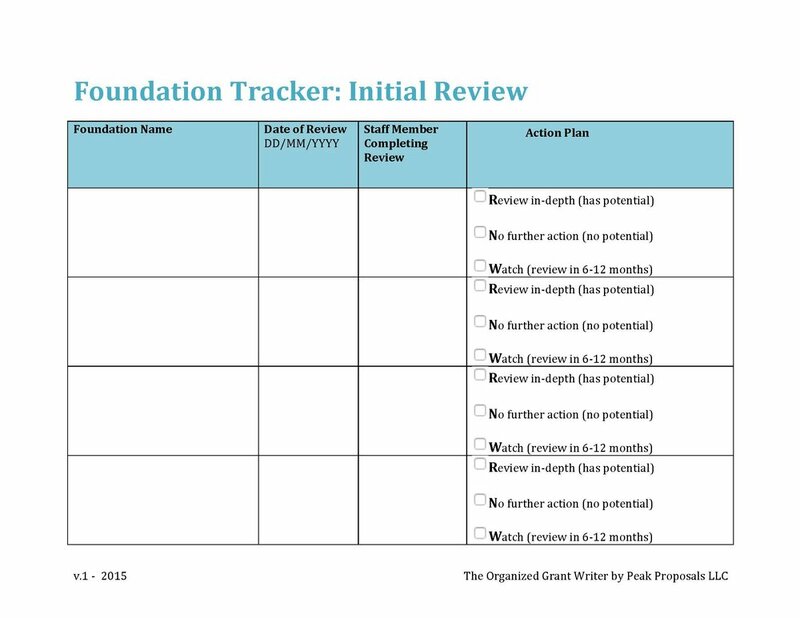 An example of a basic tracker is below, which you can download and use electronically or in hard-copy form. To begin your research, you will use your keywords (i.e., your search terms) to generate a list of foundations. Depending on your keywords, you might end up with a list of a couple hundred foundations to review. For the initial review, you 'll want to move quickly through the list, eliminating foundations that are obviously not a good fit and noting the ones with potential. If you are working as part of a team, it's important to share the results of your research with your colleagues so they don't end up duplicating your efforts. One way to share results is to store the spreadsheet in a shared folder online so everyone can access it. If you prefer working with paper, you could print out the tracker, complete it by hand, and store the copies in a binder in a central area of your office where everyone will have access. Once you've completed your big sweep and evaluated all of the foundations that came up with your keyword search, you will be left with a much smaller list. In most cases, the list will be less than half the size of the original list. reading annual reports or other publications produced by the funder. While the initial scan might take 10-minutes per foundation if you start with a database's listing, in-depth research can take 30 minutes or more per foundation. Depending on the length of your list, you may need to complete your in-depth reviews over the course of several weeks. When you complete your in-depth reviews, you'll find that many of the foundations and opportunities that survived the first cut are not appropriate and can be eliminated from your list. After the in-depth reviews, your list will have shrunk again and may be a quarter the size of the original, "broad sweep" list. To help you remember what you discovered about each foundation, it is useful to write down your key points that you learned during your research. However, you'll only be summarizing those foundations and opportunities that withstood the in-depth review, which again, will be the relatively small number of foundations that made it through your earlier assessment. If you want to create a template of your own, consider creating one that allows you to see all the essential information at a glance. The idea behind the profile is to help you gather only the information critical to helping you and your team to decide what to do next. You don't need to recap all the information on a foundation's website, you only want to capture the essential pieces of information that will help with the decision process. As with the foundation tracker, you will want to save the completed profiles in a shared folder so everyone on your team can access them. Get Organized. Identify the proposal and project teams, collect background documents, and calculate your funding needs. Choose Your Tools: Decide on your research tools and strategies. Are you going to subscribe to a donor database or use Google and other free tools? Complete an Initial Review of Potential Leads: Generate a list of potential leads by using relevant keywords (geographic location, project type, and focus area, etc.). Do a quick screening of all of the foundations that come up through the keyword search and decide which foundations look most promising and deserve a more in-depth review. Summarize Foundations with Potential: Prepare profiles of each foundation that deserves a closer look. The profile should be a snapshot of the foundation's interests, giving history, eligibility requirements, and deadlines. In the next post, the focus will be on the final stage, which involves evaluating specific opportunity announcements. For more detailed guidance and comprehensive templates on the prospect research process, check out the eBook Prospect Research Tools, which can be purchased through the online shop, The Organized Grant Writer.